It seems that sneak peeks have been few and far between the last few months. I know, I know…I say it often…I’ll try to do better – I always have good intentions of posting my favorites from each session, but sometimes it just doesn’t happen. So since today is the last Friday of February, I decided I would just make a mini-collage of a few past sessions from the last two months. When using point and click or smart phone cameras, the number one complaint from people is how to get clearer images. Do you find yourself trying to capture the perfect shot, only to find that everyone in the shot is blurry? That can be so frustrating. Try these quick tips the next time you find yourself in a photographic moment and see if your images come out much clearer! Tip 1 – Light up your subject. Whether this means going outside, going closer to a window, or moving into the available light in the room, the better lit your subject is the crisper the image will turn out. Tip 2 – Hold still, and with both hands. Our smart phones can be so small and lightweight that we find ourselves shooting pictures one handed. The movement from your hand can be a big reason for blurriness in your images. The next time you shoot, try holding the camera with both hands and holding it very still. You’ll be surprised what a difference it can make. Tip 3 – Clean your lens. Smart phone cameras can get gunky lenses quickly when we keep them in our pockets, purses, cup holders in the car, and let the kids play with them. Regularly clean your lens and you will be able to create the best and clearest images possible. Here’s a little #throwback of Mr. Ethan. 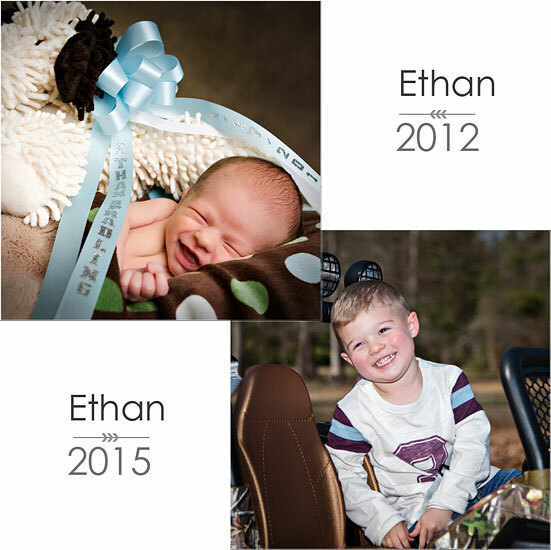 One is from 2012 at Ethan’s newborn session – I’m guessing he’s about 7-10 days old. The 2015 is from just last week when we had Ethan’s 3-year old photography session. And look at that…he’s still smiling for the camera!!! Truth be known…Ethan is at that stage where he’s not too fond of me or my camera right now. But he’ll turn around eventually & see things my way. I just know it:) Thank you to Ethan’s mommy for letting me into just a little part of his life. It’s such an honor to watch “my babies” grow from their newborn session, through out their first year in The Baby Club, and now as a part of the yearly program – The Graduate Club. Here comes Peter Cottontail and a few of his friends!!! This year we are adding bunnies, chicks, and ducklings to the Spring/Easter mini session sets!!! Don’t worry – these bunnies and chicks are perfectly safe & humane: they don’t bite, smell, or make even make a noise. We don’t have to worry about Little Johnnie or Little Jill “loving” them to death (I’ve seen that first hand…not the best thing to witness). I also don’t have to feed them and that means they don’t potty on the floor:) And another great benefit is that you don’t have to sign a 100-page liability release just in case that sweet little bunny nibbles your finger a little too hard (I’ve seen that too…OUCH). You could say that they are fake, but they are so life-like it’s hard to believe they aren’t the real thing. More on the bunnies & chicks when they “hatch”…okay, so I mean arrive. These sessions will last about 15-20 minutes max (when I say mini session, I mean mini session – I promise not to take up too much of your time). After your session, we’ll immediately preview your images (if all goes according to plan)!!! Your entire “mini session” appointment shouldn’t take more than an hour. That’s your session and preview appointment all in one. WHEN WILL THESE TAKE PLACE AND WHERE? The Spring Easter mini sessions will be on March 20th and March 21st. Sessions available from 10am until 4:30pm each day. All sessions will be “in-studio” at Sheila Hebert Photography in Splendora, TX. The session fee is only $45 (plus that lovely tax). As with all of Sheila Hebert Photography mini-sessions, all prints/products are purchased separately — you will be given a choice of images to choose from and not forced into purchasing a “CD” with images you’re not in love with. However, I think you will LOVE these!!! Special mini-session collections are available and start at $255. A la carte purchase is available as well. 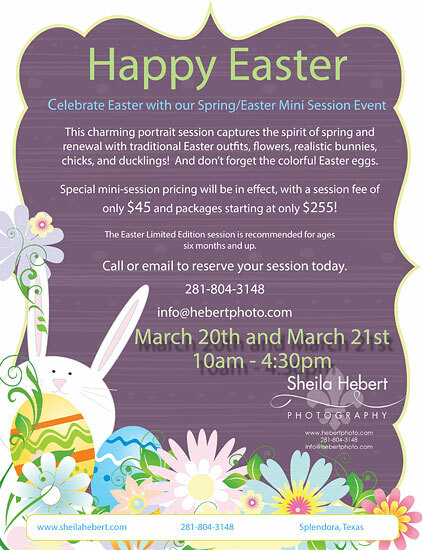 Please call 281-804-3148 or email at info@hebertphoto.com to find out more information and to reserve your time. Your session fee must be paid in advance to hold your spot – NO EXCEPTIONS PLEASE…these will fill up fast. 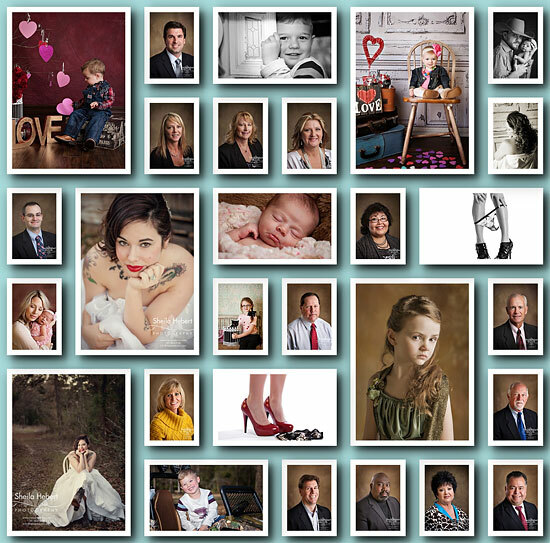 Portraiture of your family & loved ones should be considered fine art – they are the most precious for sure. If you went to an exspensive art gallery to buy a piece meant to be hung on your wall, would you just stick in a drawer or cabinet? Probably not – the same should be true for your professional portraiture. There are many different ways to display your images, but what better way than to match the frames with your home decor and make your portraiture truly look like a work of art that compliements your home? The following wall galleries are some of the most popular arrangements to inspire your own interesting and unique displays for your home. And I’d be happy to help you plan your own wall galleries for your home – the process is simple: take a standard piece of 8.5×11 paper and tape it to you wall where you’d like to create a wall gallery. Stand back and take a clear picture with any type of camera (smart phone cameras work just fine) — make sure the room is well lit. And finally email the picture over to me. From there I can custom design a wall gallery for you and show you EXACTLY how it would look in your home using your favorite images.